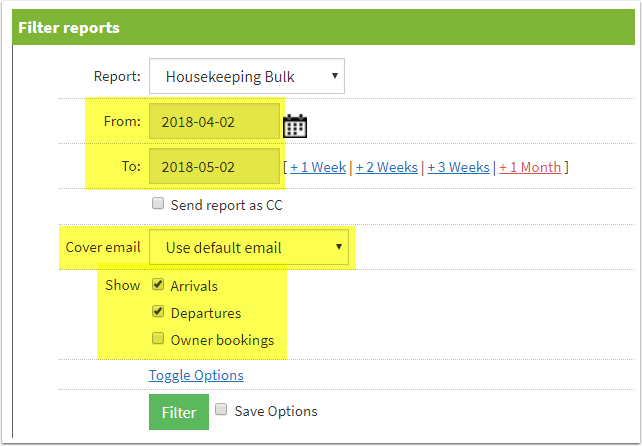 Help CentreUsing SuperControl Managing housekeepingHow do I email my housekeepers their arrivals and departures? 1. Go to Bookings > Charts & reports > Housekeeping report (bulk). 3. Click "Toggle options" to include additional information for your housekeeper. 5. A list of housekeepers with relevant arrivals/departures will display underneath. To email all housekeepers their report click "Email--All"
6. Your emails will be loaded into your queue above. If they don't appear click "Reload queue". 7. Click "Send Emails Now". 8. You will be presented with a pop-up informing you of the wait. 10. Your housekeepers have now been emailed their arrivals and departures. Prev: What does my housekeeper see when they login? Next: How do I archive a housekeeper?